This is your licence. 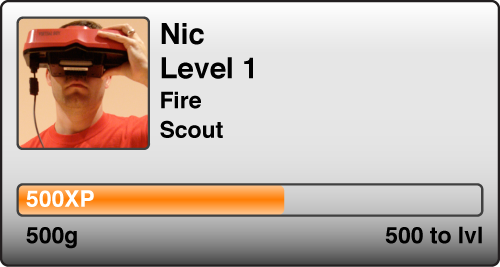 It displays your Name, Level, Element and Title. You can change your photo by visiting the licence section. Experience or xp is what we at Spirit Hunters Inc use to measure your competence. As you capture and defeat more and more spirits we will reward you with experience and currency. This in turn will allow you to gain levels and purchase new abilities and items. Defeating a spirit will reward more xp than currency, while capturing a spirit will reward you with more currency than xp. So you’ll have to balance whether you want to level up or gain more currency to purchase new abilities or items! NB: Silver and Gold spirits reward more XP than normal (with Gold rewarding the most). Elements you are weak to also reward more XP. �2006, 2015 Nnooo. All rights reserved.